Lil Country Librarian: Five Little Elves Poem, Finger Puppets and Subtraction Reader and More! 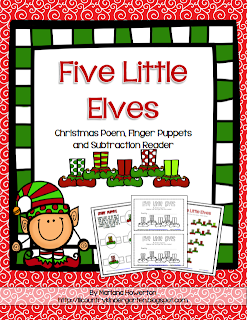 Five Little Elves Poem, Finger Puppets and Subtraction Reader and More! We ended up having four snow days off from school. For new readers, I live in a rural area and actually live on a gravel road and they don't typically get plowed until everything else is somewhat clear. The buses are only driving snow routes, but I am excited for the students to get to go back tomorrow to have their Christmas concerts the next two days. My kiddos and I are fine staying home forever, but I know a lot of my parent friends on Facebook are READY for their kids to go back. ;) I enjoy all of the unexpected time off with my family that I can get. My babies aren't going to be babies forever! 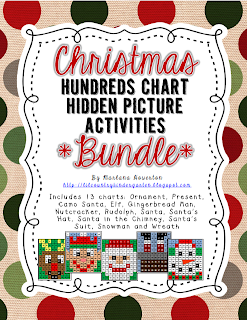 Yesterday, I had the chance to bundle all of my Christmas hundreds charts hidden picture activities into one product. I know a lot of you find this much easier. You can find it by clicking on the picture below. The bundle includes 13 charts and is on sale for $8.75. I downloaded the super cute Unwrap your FREEBIE #6 clip art freebie from Krista Wallden's TpT store and I knew I needed to create something fun for all the elf lovers out there! Click on the picture to get the poem, finger puppets and subtraction reader for only $2! This would be super easy to print and have ready before Christmas, especially if you are doing anything with Elf on the Shelf in your classroom!